The best way to support the Greek economy is to make greek dishes and then drink greek wine along with them. So I went for the greek national dish moussaka to accompany the wine. Peel the potatoes, slice them and then cook them for about 10 minutes. then drain the cooked potatoes and put them aside. Meanwhile you can cut the fresh tomatoes into blocks. Fry the chopped onion and garlic in a bit of olive oil. Add the ground beef and the oregano and bake it for about 5 minutes. Then add the fresh and canned tomatoes and let it simmer for 15 minutes. Bring up to taste with salt and pepper. Meanwhile, cut the eggplants into blocks and cook them for about 10 minutes. You can also grill them in the oven, which gives even more taste. Turn on the oven and preheat it to 200°C. Melt the butter in a saucepan and add the flour to it. Stir while thickening and then add the milk bit by bit. Add salt and pepper and let it thicken for a few minutes. Now take a baking dish and sprinkle it with olive oil. First add the mixture with the ground beef, then the eggplants and the potatoes on the third layer. Finally distribute the sauce over the dish and add the ground cheese. 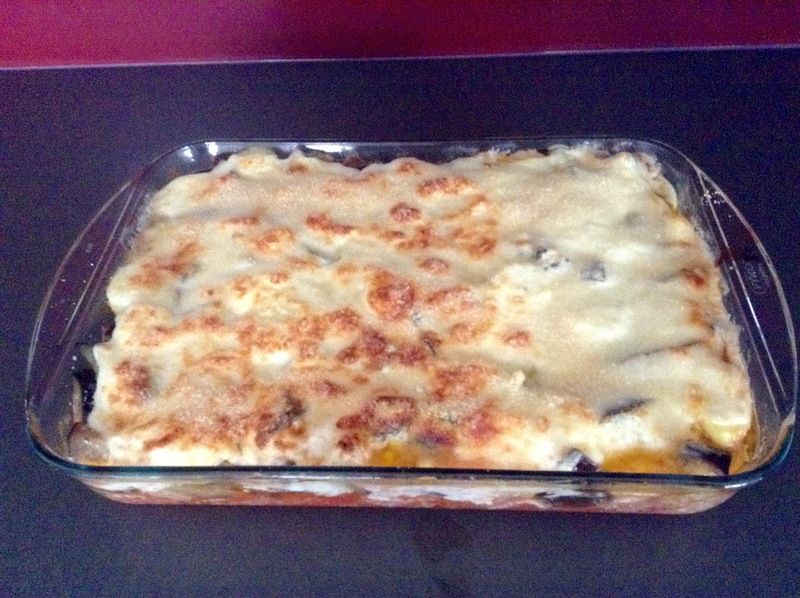 Put the moussaka in the oven for 20 minutes until the cheese become gold-brown. Let the moussaka cool down for a few minutes before serving. And most important: open a bottle of white greek wine to support the economy!